Open floor plan, expansive windows with abundant views of the Mountain Village Large picture windows with balcony, views of ski runs, mountain village.... View from living room. Kitchen Master bedroom, king size bed, with incredible views of ski runs, en suite bath Master bath Second bathroom with stand up shower. Lobby area with bear. Sitting area off of main lobby, chess games, wood burning fireplace, flat screen Hallway to left of the bear that takes you to the fitness health club and pool. Entrance to outdoor heated pool. View to North from balcony. View to north east. View to east from balcony. With ski runs View to south, ski runs at Big Sky Resort, from balcony. Lone Peak from the living room window. Shoshone Condo Hotel, You are here....ENJOY your stay : This condo is located 2 stories down from the top floor, it is a corner condo Heated pool Shoshone Condo in background. This is window on right w/ shade ope This property is on the 5th floor, corner unit, located on left side of picture. This beautifully appointed condo is located on the 5th floor and is a corner unit in the heart of Big Sky Resorts’ mountain village and ski areas. The large expansive picture windows and living room balcony offers expansive views of the lifts, ski runs, Lone Peak and majestic Rocky Mountains that envelope you in rugged Montana style. 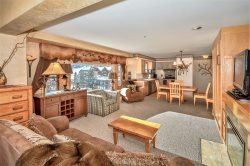 This ski-in/out condo is only steps away to the local attractions and amenities that are offered in the heart of the mountain village. OPEN FLOOR PLAN, luxury condo, is a beautifully appointed western-style living, that embraces the rustic feel of Montana. 2 elevators are conveniently located for easy access. KITCHEN: This condo has all the features for the cooking enthusiast. This kitchen has every convenience needed and is fully equipped. Right off the kitchen is a beautiful dining room with seating for six people. WALKING DISTANCE to dining, groceries, shops, massage, movie theater, attractions and amenities that entice your senses while enjoying incredible views of the majestic rocky mountains and Lone Peak at elevation 11,166’. Over 800 sf of pure comfort! * Master Suite (Main Level): King sized bed with plush down duvet, En suite full master bathroom, and a large shower. 42” flat screen TV. * Guest/Murphy Bed: Queen-sized bed. * Main Level Bathroom: full bathroom and shower. Incredible Views and a Beautiful Condo. When we arrived, we called Blackstone Property Management. A lovely lady met us and took us to the Condominium complex. She explained all of the amenities and showed us the pool, hot tub and sauna. The condo is a corner unit across from the ski hill and the view was stupendous! The condo was nicely decorated with high-end furnishings. There are two bathrooms, each having a shower. There was a Murphy bed that was very comfortable, as was the king-sized bed in the master bedroom. The kitchen was well-stocked. The condo was super clean. It felt like home. This is one of the best condos we have stayed in, in years. It is of the highest quality. You will be amazed and pleased if you book it. Montana Trip! This was one of the best vacations our family has ever taken. The unit was very clean and it was just right for our family. We had great customer. We were able to do all the things we planned to do. Jake's horses was the best. Beautiful condo! We loved the location to everything. Lots of room for us to spread out, eat together and bop around the area. The ski locker was closed when we got there so we had to bring all our equipment upstairs which was a bit of a hassle but not a deal breaker. Staff was very helpful. Beautiful condo, perfect location. This condo is a beautiful corner unit with views over the village plaza, down the valley and a partial view of Lone Mtn. It is a large airy, light-filled unit, quite a bit larger than other Shoshone condos I have stayed at. The Shoshone is perfect location, just steps away from the ski lifts. My kids love the large outdoor heated pool. We have been coming to Big Sky for years, and this was one of the nicest units we have stayed at! Great experience overall. Condo was prepared very well, had an amazing view, you get access to great amenities (fitness/ health club, hot tub/spa and many more). Location was prime within the Village (3-minute walk to Swiftie). I recommend it for everyone who is going to Big Sky and want to stay in the mountain village. Jeff K... GREAT PLACE! Great location, clean and all the amenities you will need. Management company was exceptional!! Winter Wonderland, amazing accomodations, superb location and breath taking views! This condo is so inviting, love the decor! Every detail is perfect! The kitchen setup made it easy to cook a few meals. Two big bathrooms, large king bedroom, furniture was very comfortable and plenty of room! It was the absolute perfect pick for us! My 14 year old son and two friends first ski trip to the mountains - nothing short of perfect! They loved the condo, the ski in and ski out, the amazing hot pool, shopping and dining. It's all here! No one was happier with the whole expereince! The views from the condo were breathtaking! My daughter and I don't ski and we filled our days without any problem, so much to do! We will recommend to anyone heading this way! We never used our vehicle even once! Loved seeing families, couples and groups of friends just relaxing and enjoying the whole expereince here! Easy access, great views and so close to the lifts! This condo was beautiful and spacious with incredible views. The property managers were able to get us in to the condo early so we could put our groceries away and get settled before we went skiing. At the end of a long day of skiing and a couple of drinks at Montana Jack's, we were only a couple of hundred yards from the entrance to the building. Comfy sheets, comfy beds and two nice large showers. We live only an hour and a half away, but will definitely stay here again. Review Testimonial: Jo & Dean... From initial contact with Blackstone's management, we were very impressed. The communication was excellent, right up until our arrival, they were more than helpful, especially considering we arrived on Thanksgiving Day. The apartment was extremely clean, well equipped and very comfortable. It was well styled and very cozy. We had a minor issue with one bathroom, which was dealt with immediately after contacting Blackstone Management. As the apartment is on the fifth floor, the views of Big Sky ski resort were spectacular and we were within walking distance to the snow fields. Overall, I would thoroughly recommend this apartment to others. Thanks, we will be back! Response from BlackStone Vacation Rental: Welcoming our guests from Australia! A great pleasure to have meet such wonderful people. Thank you for your review, we are thrilled to know you had a wonderful time. We take pride in making sure our guests have an enjoyable and memorable stay. The snow had just fallen prior to your arrival which it made it perfect timing for "spectacular" views, skiing, and so much more to compliment your stay. This property has the ideal corner location for unobstructed amazing views and proximity to be a part of all that the mountain village has to offer. From the start you all have been such a pleasure to work with and we greatly appreciate your business. We welcome you, your family and friends back again to experience all that Big Sky Montana has to offer. Look forward to hearing from you again soon. Thank you! Fantastic condo, close to everything! We had a wonderful, enjoyable and relaxing stay in this beautiful condo. Clean, nicely decorated and close to everything. Because of it being a corner unit, on nearly the top floor, this condo had views that were for miles and miles, breathtaking! We had everything we needed to have a memorable trip. The management staff was very knowledgeable and helpful. I would definitely recommend this home to friends and family and we WILL be staying here again! Thank you.